Ask The Bellwether: Why is spinning right-handed? One of the first things I tell spinners-in-training is that spinning is an ambidextrous sport. So, actually, it isn't truly a right-handed or a left-handed activity. Both hands are involved. And feet, on a treadle wheel. That said, on a wheel, we do tend to say you are spinning right-handed if your right hand holds the fiber supply and your left hand is closer to the orifice. Most traditional wheels are set up with this assumption, putting the drive wheel to the right and the flyer to the left. If you spin with the fiber supply in your left hand and right hand loser to the orifice, you may be surprised at how much more comfortable a "left hand" wheel can be. I was, when I visited Mr. Watson in Sydney, BC, and he pointed out my left-handedness at the wheel. So how did this right-handed lady become a left-handed spinner? In part, it was due to my interest in spindles. They are typically taught with fiber in the left hand, right hand closer to the spindle. So, when I sat down to a wheel, I kept this configuration. Learning long draw on a charka definitely cemented it in: right hand turning te wheel, left hand single-handed lay managing fiber supply and drafting. What a marvelous feeling that remains! switch your mouse on your computer to the other side, or start using your off-hand to move around on your tablet's screen. You need to be consistent with this...the hand has to learn a level of precision that seemed to come naturally to your primary hand. Give it a week to get better, and a month to feel natural. pick a two-handed instrument to learn, or dust off your grade school band instrument: saxophone, flute, clarinet, guitar, piano, drums, ukulele ... All use both hands, and what fun you will have marching in the all-sax over-40s marching band in your town's next Fourth of July parade. What, your town doesn't have one? Them get it started, by all means. learn to brush your teeth with your off hand (culture permitting). I injured my right hand in July while building my studio, so I took on this particular challenge unexpectedly. It took a while to get the off-hand to do a good job, and it took a few months for my right hand to stop grabbing the toothbrush. But four months in, I found they both did a fairly similar job. learn to do something else with your off-hand. A good friend had hand surgery, so during the 2 month recovery, she learned to crochet left-handed. I remember several friends in high school showing up in the fall with a cast on their primary arm, and having to master writing with their off-hand during the school year. Strengthening your off hand will benefit more than your spinning; my left hand is now much better at whisking cream, and my hands participate more equally when I weave. So, dive in, spin, and marvel at how talented both of your hands are! Exactly!! I chose a castle wheel for this reason. I have never even attempted spinning with my left hand forward, just didn't seem natural to me. As a leftie, I'm accustomed to adapting activities. Apparently I knit right-handed, as I was taught by a rightie, but I hold my needles so that my left hand is doing most of the work. With spinning, I couldn't figure out what was right-handed or left-handed. I'm still somewhat clumsy as a spinner, but that's more due to my newbie status! Turns out that I'm spinning left-handed but didn't know it. Very interesting. I spin left-handed (apparently) although I'm a rightie in other things. I don't know why. I learned in 1978, so have no memory of how it came about. But I tend to spin woolen and have always "drawn" with the left hand. Thank you so much for this info. 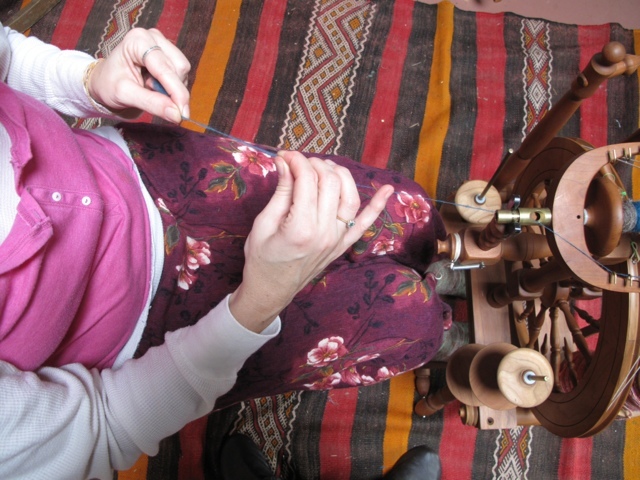 Now I finally know WHY I am a left-handed spindler: I learned how to spin on a wheel, but it didn't work out for me as the process is too fast for my hands and brain. Now I have a spindle, which I enjoy tremendously, and it still makes sense to me to hold the wool in my right hand and turn the spindle with the left! !! I guess I've been left handed spinning this whole time? I only have a joy though so I don't know if it matters. I'll keep this in mind when I looks for a non traveling wheel. Also I think it now makes sense that I can't knit english style. I've always been a continental knitter. it never felt 'right' HA! I never thought about this. Very interesting info! Never occurred to me I was a "left-handed" spinner. Probably the same, "spindle-interest", and that the people I saw spinning also had the right hand forward. I don't think I want to try the reverse.